There are several antihistamines for allergies on the market today. It can be difficult to choose the one that’s right for your needs. It’s a good idea to take a close look at each one so that you understand what it has to offer. Two of the most commonly used allergy medications are Flonase® and Zyrtec®. Both have distinct benefits. Each one also has features that may make it a poor choice, depending on your age, health, and other important factors. Both medications are over-the-counter, questions you have concerning either one, can be addressed by your physician. Flonase is an allergy medication that, by all reports works well in patients who choose to use it. It comes in the form of a nasal spray and has few known side effects. Because it is administered directly into the sinuses, the medication doesn’t travel widely throughout the body. One of the main drawbacks many people report is nosebleeds. Nosebleeds become more common as usage of the medication increases. Its primary use is the control of upper respiratory allergy symptoms that include sneezing and runny nose. People who have experienced traumatic injuries to their nose or nasal passages shouldn’t use Flonase. It is also believed to arrest the growth rate in children. 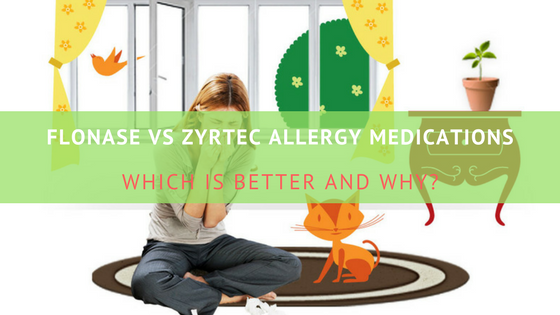 Zyrtec is also one of the many popular antihistamines for allergies. It is taken once a day, allowing 24-hour relief of most allergy symptoms. Because the medication is released into the system slowly there is less risk of drowsiness. In addition to being effective at treating common allergy symptoms like sneezing, itchy eyes and a runny nose, it also helps to control skin rashes and hives. It offers quick relief of most symptoms and can be taken by both adults and children with few side effects. It can be purchased in liquid form, tablets and dissolving tablets that melt quickly when placed under the tongue. Zyrtec has very few drug interactions and can be taken along with other medications. Which Antihistamines for Allergies Is the Best? 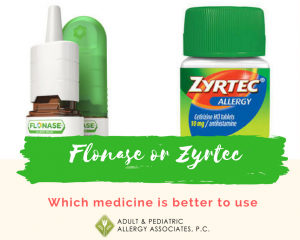 Both Flonase and Zyrtec are antihistamines for allergies and work well when used by the right people and in the right situations. Everyone is different when it comes to taking medications. Although Zyrtec is extremely popular, it has a tendency to decrease in effectiveness the longer it is used. If you are unsure as to which medication best suits your needs, talk to your doctor. He or she will be able to answer any question you may have and be more equipped to help you choose the right antihistamine for your particular symptoms. Working with your doctor will prevent you from taking a medication you don’t need or overusing one that you do. If you have questions or concerns about any medication you are taking, especially antihistamines for allergies, contact the medical professionals at Adult & Pediatric Allergy Associates. They can answer your questions and get you on the medication to stop the symptoms from reappearing. Don’t risk taking the wrong medication or taking too much of the right one. Schedule an appointment today to get the answers you need! Congress will be voting on H.R. 4775. What will it mean for allergy sufferers? Ozone is a reactive gas that is composed of three oxygen atoms (O3). It can be either natural or man-made. Natural ozone is created by oxygen in the atmosphere interacting with UV radiation; this is how the Earth’s ozone layer was created. Up in the atmosphere, ozone works to filter UV radiation and keep it from reaching the Earth’s surface. Man-made ozone results from reactions between volatile organic compounds and nitrogen oxides. VOCs can come from chemical plants, gasoline pumps, oil-based paints, auto body shops, and print shops. Nitrogen oxides often come from high temperature combustion, sources of which include power plants, industrial furnaces and boilers, and motor vehicles. While high ozone levels are typically associated with large urban areas, they can occur anywhere. Ozone can travel for hundreds of miles on wind patterns, settling in new areas far away from where it originated. This also means high ozone levels can occur at any time of the day or night, though they risk being the highest in the afternoon during the heat of the day. In addition, research has shown that higher levels of ozone in the air can lead to increased asthma attacks, hospitalizations, and risk of death. Ozone can trigger asthma attacks, increase sensitivity to asthma triggers, and aggravate existing asthma symptoms. First, it will delay the clean air standards set by the EPA in 2015, extending the deadline for compliance until October 26, 2024. In addition, it will delay the EPA declaring areas of the states as ‘attainment’, ‘non-attainment’, or ‘unclassifiable’ under the 2015 NAAQS regulations until 2025. Second, it will change the EPA’s review cycle for criteria pollutants from a 5 year cycle to a 10 year cycle, with the next review not being allowed before October 26, 2025. And prior to establishing any new regulations, the EPA must meet with its advisory committee to assess the benefits and costs associated with making changes to the NAAQS. So what will this mean if you suffer from asthma or other respiratory allergies? It means the clean air requirements that were established by the EPA in 2015 will have their implementation delayed until at least 2024. Supporters of the bill may cite the costs of retrofitting manufacturing facilities to meet these higher air quality standards on relatively short notice, and they may also cite the costs of retrofitting old factories to meet these new standards. It could potentially mean that manufacturing facilities in U.S. cities with the worst air quality will have more time to retrofit their facilities to meet the new requirements, leading to many more years of individuals suffering increased allergy and asthma attacks due to pollution. 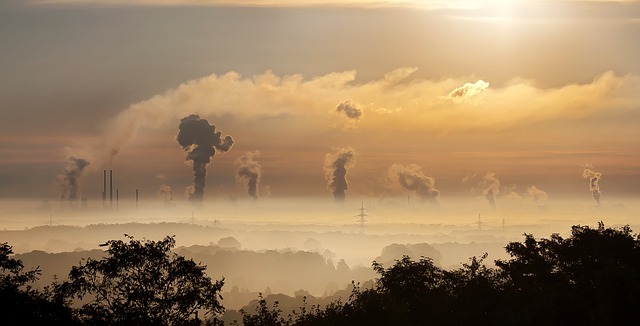 It could also potentially weaken the Clean Air Act’s limits on other potentially dangerous pollutants, such as Carbon Monoxide, lead, nitrogen dioxide, and sulfur dioxide, leading to an increase in those pollutants in the air. 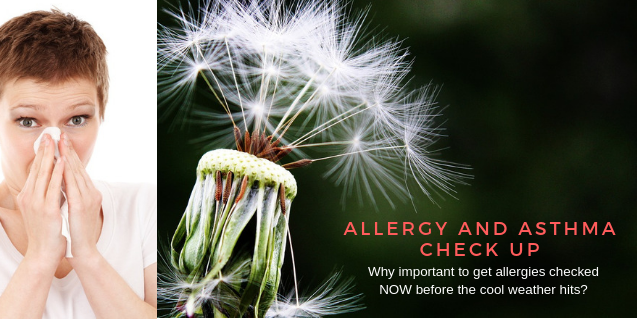 Info brought to you by your staff from Adult & Pediatric Allergy Associates, P.C..